Joe also heads news and programming operations for the network of 26 WAMC/Northeast Public Radio stations throughout New York and New England. And, hosts the nationally syndicated “Book Show.” And, remains close to Saint Rose, where he earned his bachelor of arts in public communications and now teaches courses in radio production and interviewing and follows the progress of students after they graduate. 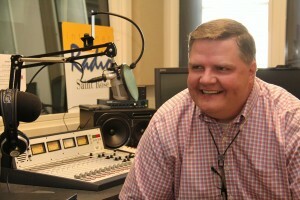 Saint Rose: Regular listeners know where you live (Washington County) with whom (your wife, Kelly, and your dog, Brady.) They knew when each of your parents died and where you last vacationed with your beloved nieces and nephew. Is your on-air personality the real you? JD: I don’t walk around with my radio voice when I am in the supermarket. There’s my “radio” voice and my “Joe” voice. When I interview someone, I don’t offer my opinion. But as host, people know me as the “upstate New York guy,” “the Catholic guy,” the “longtime married guy.” My mom died and my dog died. I received 10 times the mail from people after the dog died, which was interesting. I got a lot of beautiful tributes from shelter groups and organizations. Saint Rose: On any given day you might interview a Broadway star or preeminent author and move on, perhaps, to a renowned historian or athlete. Your questions reflect significant knowledge of these individuals and their work. How do you keep up? JD: The answer is, it’s constant. Tomorrow, we have a book pick segment and I will look at the list and familiarize myself. We will have the (daily) panel discussion. We have jazz drummer Jack DeJohnette. I know his story. You’re cramming for the exam all the time. I’ll review the topics tonight and write the script. The script gets you in and out. It’s preparation that makes the difference. You don’t just sit down with the person. Saint Rose: But, no amount of preparation can prevent mishaps, right? JD: But if you are prepared and have done your homework and know what you are getting into and what can transpire, you have confidence. You know that anything can happen and you will be okay. I had someone die on the air – Wolfman Jack. Once you’ve had that happen to you, you are ready for anything. I was interviewing Wolfman Jack via phone and the line went silent. I figured we had lost the connection. I vamped and moved on. I learned later that he had died. I relied on preparation and confidence during “the recent incident.” People said I seemed unflappable. My wife and my producer knew inside I was dying a thousand deaths. Saint Rose: The “recent incident”? 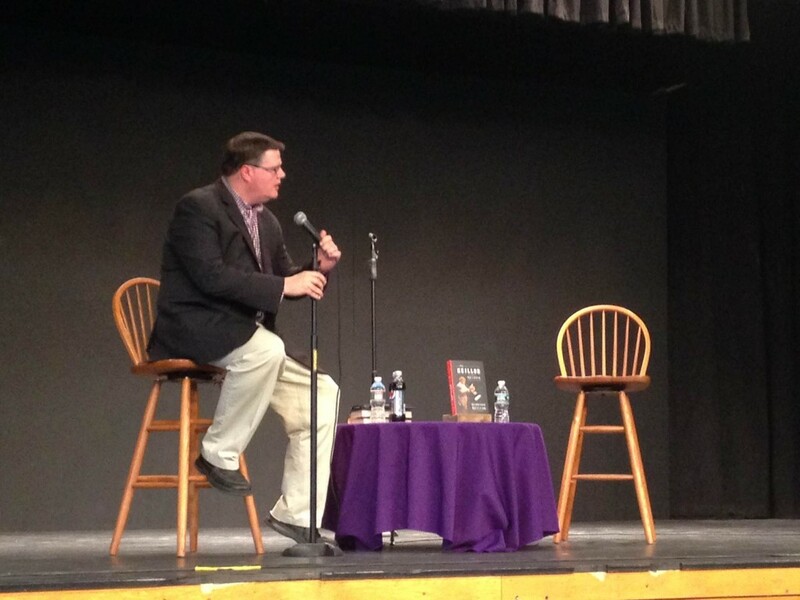 JD: We were doing a half-hour show with Garrison Keillor at an elementary school in Manchester (Vermont.) When he came, there were 750 people and more were coming in. We wanted to set up more seating and asked if he could wait 10 minutes. He said “I’ll get them singing,” and walked right into the auditorium and started singing hymns. It’s half an hour later and he’s still into it, singing Beatles songs and telling stories. And I wondered if we could ever get a show out of it. (Finally) he says, “Mr. Joe Donahue will now join us.” I said, “Could you join us on stage?” He said “I’m good.” I said “What do you mean, you’re good? You don’t have a mic. I really think you’d want to do the interview on stage.” He said “No.” Then he said “let’s see what the audience wants. You want me to stay right here, right?” and they turned against him and urged him to go onstage. But he refused. There was no way around it. So we brought a mic to him, and I sat on a stage with an empty chair and it was really strange. We got a show out of it. It worked. You come out of it feeling that there is probably nothing we can’t handle. 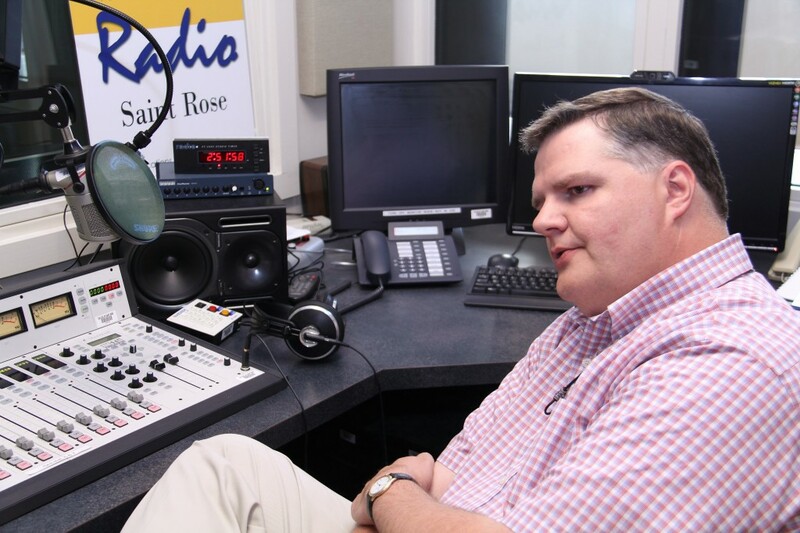 Saint Rose: It’s time for the “What-is-the-future-of-radio?” question. JD: I talk about this a lot with students. My belief is that students who come out of this program and other programs will be okay. There will be some version of print newspapers. People will always want to read obits and read about softball games and the local news. And people will always want someone in the car with them. I have people who say “at the end of the week I look at your podcasts and figure out which program I want to hear and listen to them in the car.” Do we care how we you get the news? No. You’re still listening and either way it’s free. Radio ownership is in fewer hands. You used to go to the Saratoga Race Track on opening day and you’d see trucks from 15 different radio stations. Now you see two trucks. But, two owners own 15 stations. Saint Rose: Why not move to a larger market? JD: It’s a joint decision. We’re in the same business. Kelly is in PR, I am in broadcast. We’ve both been lucky to stay here and grow. I’ve had such great luck to be with WAMC, in a market that covers seven states, and carve out a job for myself and make it home. I tell my students there are fantastic journalists who came into this market and are still here. If I went to Boston, the money might be about the same and there would be a lot to see and do, but I wouldn’t get to live on top of a mountain in the middle of nowhere, which is what I like. Saint Rose: Why do you stay so close to Saint Rose? The communications program is like a second home to you. JD: I used to say that my experience was abnormal. I have wanted to do this my whole life – I had my first radio gig when I was 10 years old. When I came here I had a job in radio part time. How do you stay in school to study for the job you already have? Now, as an adjunct, you never leave these kids. All of us in the communications department will fist-bump each other when one of our students gets a job in the industry. It is a thrill – a frequent thrill. Saint Rose: To say you are a reader is a little like saying Jimmy Fallon likes to joke around. How many books do you read each week? When do you have time? JD: The average is seven to 10, I guess. But it is hard to quantify because it is a constant process, and I will have several books going. I will have one at home, one at the office, one in the car on CD, and read them simultaneously. But, I am the son of a librarian. This is really nothing new for me. It’s only hard when the book is awful. And it is important to point out that just because I interview the author doesn’t mean I liked the book. The point is to interview the author, not review the book – that is not my job.